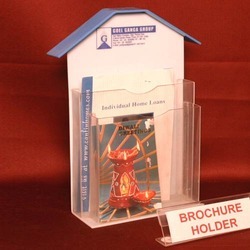 Our products Acrylic Brochure Holders are designed and developed from finest quality acrylic and foam to ensure production of quality assured and durable range of products. These are available in a variety of designs, colours, shapes, sizes and patterns. 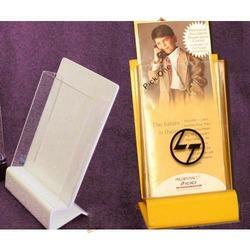 Elegant acrylic brochure holders are manufactured in A4 & 9x4 sizes. We are listed at the apex for manufacturing and trading superlative quality Single Magazine Holder. 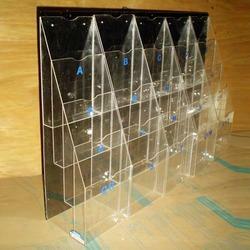 Owing to the high quality acrylic used for manufacturing, the offered product is assured of its long lasting life. 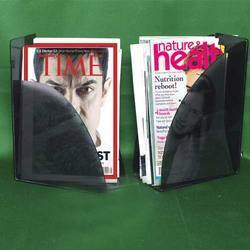 Non-toxic in its features, this magazine holder offered by us is highly regarded among the clients we have. This offered magazine holder is further known for its durability. 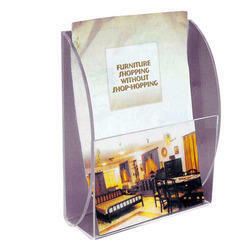 We are one of the leading manufacturers and traders of a vast range of Step Brochure Holder. Manufactured in accordance with the prevailing market trends, it is widely praised among our clients. 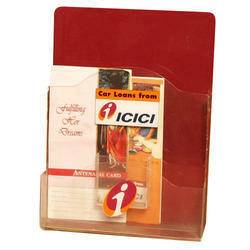 Eco-friendly and non-toxic in its features, the whole range of the brochure holders offered by us is highly renowned. We further make the offered product available at competitive prices. 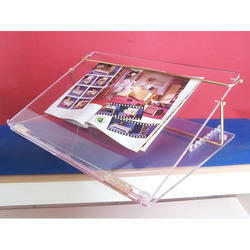 We are one among the prominent manufacturers and suppliers of supreme quality Acrylic A4 Brochure Holder. Known for its stability, it is widely acknowledged among our valued patrons. In addition to this, the whole range of the brochure holders offered by us is highly regarded for its long lasting life, fine finish, and attractive design. 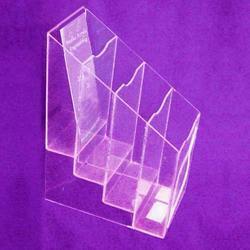 We are engaged in the business of manufacturing and trading of premium quality Custom Acrylic Brochure Holders. Manufactured using high quality acrylic material, it is highly popular among the clients we have. Attributing to its durability and exquisite design, the entire range of the pocket brochure holders offered by us has heaped immense appreciations among our clients. 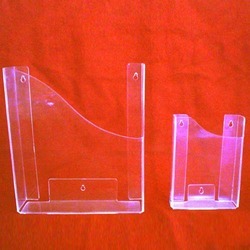 We are the established manufacturer and supplier of best quality Outdoor Acrylic Brochure Holder. Made using high quality raw materials sourced from the credible vendors, we guarantee the premium quality of the whole range of brochure holders we offer. To fulfill the diverse requirements of our clients, we make the offered range of products available in various sizes. 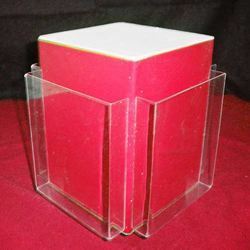 We are one of the few names that is engrossed in the manufacturing and trading of high quality Acrylic Desk Brochure Holder. Known for its impact resistance, the offered product has fetched high demands in the market. Easy to clean, it is widely acknowledged. To cater to the diverse requirements of our clients, we make the offered product available in different sizes. 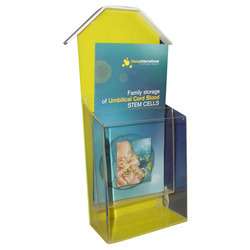 We are engaged in the manufacture and trade of a wide range of Acrylic Outdoor Brochure Holders that are quite popular in the market. 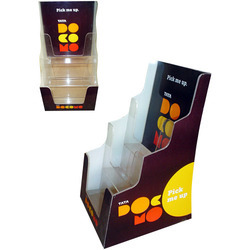 Provided in various sizes, these brochure holders are made from optimum quality plastic procured from our clients. These durable and spacious holders are widely appreciated for their neat finishing and lightweight. 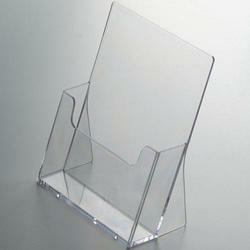 We bring forth an outstanding range of Acrylic Rotating Brochure Holder, which is highly popular among our clients. Known for their attractive designs, these possess high demands in the market. 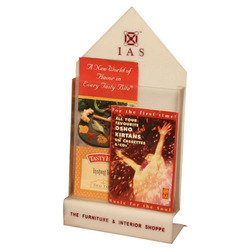 Owing to their durability and perfect finish, the entire range of brochure holders offered by us is highly regarded among our client-base spread across the nation. 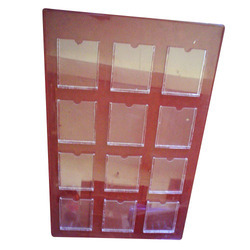 We are counted as the reputed manufacturer and supplier of supreme quality Magazine Holder that is manufactured using high quality raw materials sourced from the reliable vendors. Owing to its portability and stability, the offered product is highly acclaimed in the market. In addition to this, the whole range of the products offered by us is widely regarded for its exquisite designs. We specialize in the manufacturing and trading of best quality Simple Brochure Holder that is manufactured using high-grade raw materials. Attributing to their durability, fine finish and light weight, the entire range of the holders offered by us is widely applauded among the clients we have reaped so far. The offered product is further eco-friendly in its features. 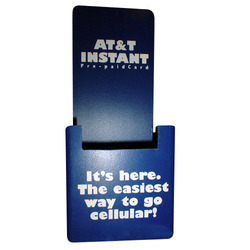 Our company is one of the trusted names in the industry to offer an exquisite series of Acrylic Pamphlet Holder. We make use of fine quality plastic obtained from our reliable vendors for manufacturing these lightweight and long lasting card holders. The offered range is quite popular among our customers for its huge capacity, superior finishing and low maintenance.